"Oh, you haven't heard of mirror humans? Let's back up a moment. "Life is made of lots of little molecules, and these molecules make up import­ant bigger molecules, like DNA, RNA, and proteins. 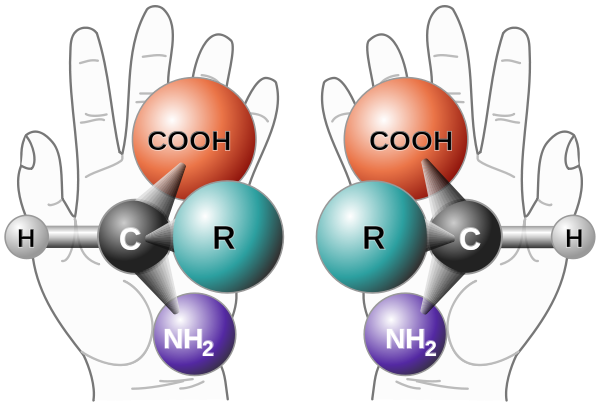 Some molecules exhibit what is called chirality, from the Greek word for 'hand.' If a molecule has chirality that basically means there is a mirror version of it. "To wrap your head around 'mirror versions' of things, think about your hands. They look exactly the same, but no matter how you rotate your left hand, it won't be exactly the same as the right. If you have your palms up, your left thumb will point left and your right thumb will point right. Each hand has all the same parts, but they are flipped, as if through a mirror. "When you have two molecules that are mirror images of one another, one of these molecules is designated as the left-handed version and the other as the right-handed version. Intriguingly, life seems to favor a certain handedness for particular tasks. For example, almost all amino acids (which you may remember from previous chapters are the building blocks of proteins) are in the left-handed form. Why nature abhors right-handed amino acids is a topic of debate, but even the amino acids we find in space tend to be left-handed. "But screw nature. Whatever her reasoning is, there is no known physical reason we couldn't create an organism out of completely opposite-handed molecules in the lab -- a 'mirror organism,' if you like. Some scientists, including Dr. [George] Church­ [of Harvard], are working to create (simple) mirror organisms, with the hope creating larger and larger such creatures. Why exactly would we want this? Well, for one, it's awesome. You create something that looks like a nice little kitty, but is totally incompatible with the rest of the life on the planet, perhaps even the universe. For example, mirror-opposite organisms would need to eat mirror food in order to be able to digest it. They would also be undigest­ible to all predators. Best of all, a mirror-opposite organism would be com­pletely immune to all diseases, because all living parasites and pathogens evolved to infect organisms with normal chirality. "And if it worked, hey, we could scale up to making mirror-opposite humans. "Mirror humans would be immune to all the diseases that have plagued human­ity for centuries. Malaria? No problem. Tuberculosis? Meh. "Okay, so there'd be downsides too. They'd need mirror food, perhaps mirror microbes. And, if a mirror disease evolved, they'd need mirror medicine. They'd also need mirror partners if they wanted children. "Ah yes, what of love between mirror-original and mirror-opposite humans? "Couples comprised of different mirror-type people would, you know, fit to­gether. But they would not produce any living offspring, because you can't mix left-handed and right-handed people when it comes to genetic material. Look, we're not chirality bigots. We think heterochiral couples might get along just fine, but we just worry about the children. Mostly because they wouldn't get to exist. "Although mirror-opposite people would look pretty much the same to our eyes, they would be members of a separate species. Being genetically isolated populations, we would slowly go from being similar but incompatible to having different physical and psychological characteristics over time. 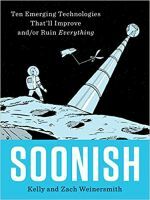 Given that we mirror originals would be comparatively disease riddled, it probably wouldn't be long before the mirror-opposites looked at us like we were a shambling horde of zombies."